Barcelona pide incorporarse a la "Red de Ciudades por la Accesibilidad"
Barcelona ha decidido pedir su incorporación a la Red de Ciudades por la Accesibilidad que se creó el mes pasado en Málaga durante la celebración del tercer Foro Internacional de Dise?o Universal y Movilidad, en el que la capital catalana no participó. A propuesta del grupo socialista, la comisión de Seguridad y Movilidad del Ayuntamiento de Barcelona ha aprobado por unanimidad instar al gobierno municipal a llevar a cabo los procedimientos oportunos para formar parte de la nueva red y a realizar las actuaciones oportunas para que Barcelona pueda participar en la próxima edición del foro. También le ha pedido que incorpore "los criterios, en aplicación de la normativa municipal, de la guía recopilatoria de implementaciones en las zonas urbanas para mejorar la seguridad vial y la accesibilidad de la Fundación ONCE y la Fundación Espa?ola para la Seguridad Vial". La concejal del PSC Pilar Díaz ha asegurado que "Barcelona, por trayectoria y experiencia, puede aportar mucho para la accesibilidad"
También ha destacado que ya son una veintena las ciudades que han manifestado su interés en formar parte de esta red que y ha puesto como ejemplos Vitoria, Torrent, Valencia, Santander, Cáceres, Basauri, Pamplona, Granada, Sevilla, Burgos o Valladolid, todas ellas premio Reina Sofía de Accesibilidad. El concejal de Movilidad, Eduard Freixedes, ha anunciado que la adhesión ya se está preparando y ha manifestado su confianza en que esta incorporación sirva para ampliar el Observatorio Europeo Ciudades y Pueblos para Todos que Barcelona impulsa desde 2003 y del que forman parte 88 ciudades de 16 países y 21 organizaciones. Summer is for vacations and fun. We all enjoy being outside, traveling and exploring new cities and countries. For some people, however, traveling, or just simply moving around is a major hurdle. Imagine that problem arises every time you want to leave your apartment, use public transportation, cross the street and get into a café or museum. What if this problem stands in the way of getting to your university, place of work, or of getting medical assistance? Many people with disabilities in Ukraine face such difficulties every day. In order to try to tackle this problem, the United Nations (UNDP, UNICEF, ILO, and WHO) joined forces with the Government and civil society organizations in Ukraine to promote policies that take into account the needs of people with disabilities. The United Nations programme is encouraging the adoption of accessibility and universal designstandards by a wide variety of actors within society - from municipalities to private sector companies. Universal design is a concept that states that all products, infrastructure, buildings, transport and services should be designed in way that makes them usable and accessible to as wide a range of people as possible. Universal design is not only for people with disabilities but also for elderly people, parents with strollers, people with different body sizes and functional limitations. Although awareness of universal design principles in Ukraine is quite low, I like to think that there is a great level of ingenuity in the country that we could tap into to raise awareness of the issue and, perhaps most importantly, come up with solutions. Just think of these amazing Ukrainian students who invented gloves that convert sign language into speech! Could we work with other citizen experts to make universal design popular in Ukraine? I certainly like to think so! Do you have experience to share of promoting universal design and making sure the universal design principles are taken into account when designing public spaces, buildings, transport, products and services? Have you developed or invented interesting solutions that can showcase the value of applying universal design principles to policy makers? Do you think they could be applicable in the Ukrainian context? Would you be interested in sharing your story? Are you interested in co-developing a knowledge base (in Ukrainian and Russian) that decision-makers and community members can use to improve their understanding of universal design principles? All pointers and suggestions are most welcome. We are up against a major challenge - but I know that there is plenty of experience and energy that we can draw upon to make a real difference. La ciudad de Santander, y más concretamente su servicio de transporte público, ha estado presente en el III Foro Internacional de Dise?o Universal y Movilidad en la Ciudad, que se celebró en Valencia el pasado miércoles cinco de Junio. La capital cántabra ha mostrado, como ejemplo de buenas prácticas, su experiencia "en el desarrollo de actuaciones y servicios encaminados a conseguir la accesibilidad universal". La ciudad ha estado representada por el concejal de Autonomía Personal, Roberto del Pozo, quien ha participado en un foro en el que se han reunido representantes de siete ciudades espa?olas, arquitectos, urbanistas y representantes del mundo de la empresa para debatir "sobre la mejora de la accesibilidad en viviendas, edificios y trasporte público, así como la incorporación de la tecnología para fomentar entornos de vida normalizados", según han explicado los responsables del Ayuntamiento de Santander, a través de su página web. Además de exponer las diferentes medidas que el Consistorio de Santander está llevando a cabo para garantizar el acceso universal a la vivienda, el concejal de Autonomía Personal ha recordado que toda la flota municipal de autobuses "está adaptada para facilitar su utilización por parte de las personas con movilidad reducida y discapacidad sensorial". Roberto del Plozo ha mostrado su satisfacción por la presencia de Santander en este evento, a?adiendo que "desde el equipo de gobierno estamos muy satisfechos de que, una vez más, el nombre de Santander esté presente en un foro internacional sobre accesibilidad y que la política desarrollada en este campo sea considerada como un ejemplo de buenas prácticas por los máximos representantes del sector, tanto del ámbito privado como público". Palau ratified the CRPD and the OP on 11 June. The U.S. Access Board has redesigned its website, a leading resource on accessible design. The new site improves navigation so that the various resources available from the Board are easier to locate and search through. These include copies of all Board guidelines and standards and related information, such as companion guides and research reports. Site content is more clearly organized by subject matter across the different areas of accessibility addressed by the Board's work. The site also features enhanced search options and page layouts that improve usability and make related information easier to access. Check out the new site at www.access-board.gov and be sure to update any bookmarks to internal pages. Comments or questions about the site should be directed to Bruce Bailey, the Board's webmaster, at webmaster@access-board.gov. MANY accessible facilities in public buildings are non-functional from day one. This is a poor reflection of the people who design buildings as a profession. The facilities are included without considering how safe and functional they are for disabled people. In other cases, accessible facilities are totally excluded at the design and construction stages, and only added as an afterthought after the buildings have been completed. Their additions are severely constrained by the existing structures. Needless to say, many of these facilities are also not usable as well. There is also a general perception that it is difficult to merge these facilities into the design as they tend to spoil the aesthetics and take up too much space. For example, a ramp with a gentle gradient and handrails is seen as spoiling the lines and form of a grand flight of stairs at the entrance. The Inovaccess project seeks to create the conditions for continuous accessibility within the urban and business environments by working on all links of the mobility chain (public realm, transport, built environment). 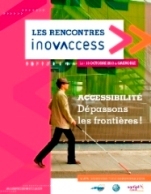 The aim of the project, implemented in Grenoble for more than three years, is to provide complete and continuing accessibility for anyone, regardless of any impairment they may have, from the city to their place of work, in an urban area employing a high number of people. Is the inaccessibility of businesses holding back the employment of disabled people? Does undertaking works to improve the accessibility of professional facilities promote access to employment? What solutions are there for integrating the full range of user ability limitations? How can the different links of the mobility chain be connected effectively? Speakers include well-known experts in the field of accessibility and Design for All, such as Marie Prost-Coletta, the French Ministerial Delegate for Accessibility and Design for All Foundation Awards jury member, Xavier Berthet and Pierre Revol of accessibility consultancyHandigo and Design for All Foundation President Francesc Aragall. Mobility International USA (MIUSA) has launched our KICKSTARTER campaign to fund one of our most ambitious and entrepreneurial ideas to revolutionize the status of women with disabilities around the world. Join us to support our goal to raise $10,000 in 28 days (ending July 19th, 2013). Your support comes with some great rewards including tickets to a photo exhibition, signed copies of the published book, and more! When we reach our goal, we will publish a professional, 124-page, full color, photographic book, featuring powerful portraits and personal stories of 50 disabled women activists from 41 countries. All alumni of MIUSA's Women's Institute on Leadership and Disability (WILD), these women are confronting discrimination and working tirelessly to improve the lives of women and girls with disabilities across the globe. The Access Board has released for public comment proposed guidelines for passenger vessels. Developed under the Americans with Disabilities Act (ADA), the guidelines provide design criteria for large vessels when newly constructed or altered to ensure that they are accessible to people with disabilities. The guidelines address various features of vessel accessibility and include provisions for onboard routes, vertical access between decks, doorways and coamings, toilet rooms, guest rooms, alarm systems, and other spaces and elements used by passengers. "The Board is pleased to unveil proposed guidelines that will ensure access to vessels for passengers with disabilities," states Access Board Chair Karen L. Braitmayer, FAIA. "We know from experience that barriers to accessibility are often due to a lack of clear and detailed design guidance, and this rule will fill a long-standing gap in making passenger vessels accessible to all." As proposed, the guidelines would apply to cruise ships and other vessels that carry over 150 passengers or at least 50 overnight passengers. They also cover ferries designed to carry 100 or more passengers and tenders allowed to carry 60 or more passengers. The Board is not proposing requirements for smaller vessels due to design challenges, space constraints, and other factors. The guidelines would apply to newly built or altered vessels. In laying the groundwork for this effort, the Board conducted research on the feasibility and impacts of integrating accessibility into the design of vessels. This information includes case studies on vessels of various types and sizes, examination of design solutions to identified design and engineering constraints, and cost and impact analyses. The Board previously released advance drafts of the guidelines for comment which were based on recommendations from two advisory panels organized by the Board, the Passenger Vessel Access Advisory Committee and the Passenger Vessels Emergency Alarms Advisory Committee. The Board is developing these guidelines under the ADA, which requires access to transportation and other services and to places of public accommodation. Under the law, the Board is responsible for developing minimum guidelines covering access to transportation systems and to the built environment. The vessel guidelines, once finalized, will join the Board's ADA Accessibility Guidelines for Vehicles, which are currently being updated, and its ADA Accessibility Guidelines for Buildings and Facilities. The new guidelines will be used by the Department of Transportation and the Department of Justice in setting mandatory standards. The proposed guidelines and related information can be accessed, and comments submitted, through the federal government's rulemaking portal at Trang web cá cược trực tuyếnwww.regulations.gov. Instructions for submitting comments are included in the proposal. The deadline for comments is September 23, 2013. The Board will hold a public hearing on the guidelines in Washington, D.C. on July 10. Visit the passenger vessels homepage on the Board's website for more information or contact Paul Beatty at pvag@access-board.gov, (202) 272-0012 (v), or (202) 272-0072(TTY). Note: For the comfort of all participants and to promote a fragrance-freeenvironment, attendees are requested not to use perfume, cologne, or other fragrances. Professor Dimitrios Buhalis explains the benefits of providing appropriate tourism and travel services for people with disabilities. He discusses the size of the market and the economic benefits as well as the social responsibility aspects. He concludes that all tourism facilities and destinations should provide appropriate information about their accessibility and make suitable adaptations to serve this market. With the right attitude tourism organisations and destinations can gain the trust and the benefits of the accessibility requiring markets. The research undertaken in published in his books Buhalis, D. Ambrose, I., Darcy, S., 2012, BEST PRACTICE IN ACCESSIBLE TOURISM : Inclusion, Disability, Ageing Population and Tourism, ISBN 1845412524 Channel View Publications and Buhalis, D. Ambrose, I., Darcy, S., 2011, Accessible Tourism Issues: Inclusion, Disability, Ageing Population And Tourism, ISBN 1845411609 Channel View Publications. The 5th Universal Access In Airports (UAIA)conference will take place at the Chicago Marriott O'Hare on Oct. 6-8, 2014. This biennial event, hosted by Open Doors Organization, brings together airports, airlines, service companies, suppliers and the disability community for a unique exchange of ideas on how to best meet the needs of older air travelers and those with disabilities. Aaron Murphy, of the website Empowering the Mature Mind, has written a great piece about how re-zoning and creative thinking is needed to restructure our communities to be more age friendly. We often think of Aging in Place as an issue of home modification, but livable communities are also necessary if older adults are going to remain active members of the community. Of course livable communities benefit everyone: young single adults, families with children and older adults alike. Murphy puts forth some ideas for how we might start thinking about radically reshaping the suburban landscape. What if abandoned big box stores were converted into Senior/Community Centers? What if the vacant parking lots at strip malls were rezoned so that they could be covered in cottage housing surrounding a park or other common space? What if abandoned car dealerships were transformed into accessible mixed-use apartments with commercial space on the ground floor? You can read more about these and other ideas at Empowering the Mature Mind. I sat in the underground train exhausted, wondering how long it would be before we got to our stop. There was no announcement coming from the overhead speakers, but a man's voice saying "Mind the gap" rang in my ears. My friend Pat was sitting next to me, holding my collapsible wheelchair in place. "I was right," I said to him. "Europe is not accessible." While I agree that in parts of Europe, travel in a wheelchair is challenging, certainly it has come a LONG way in the last ten years or so. My company, "Undiscovered Britain & Ireland, Ltd" (www.undiscoveredbritain.com) specializes in travel throughout the United Kingdom, including England, Scotland, Wales, Northern Ireland, as well as to the Republic of Ireland for persons with all levels of mobility problems, from mild to severe. We book clients in fully accessible rooms with adapted bathrooms with roll in showers and seats; we use drivers who have accessible vans for sightseeing out of the cities, and we are aware of accessibility at various attractions, restaurants, pubs, etc. We have been doing this since 1997 and we have clients all over the USA and Canada who have relied on us to make their travel dreams come true. With regard to the Underground in London, had you been one of our clients, I would have strongly suggested that you NOT travel on it; but instead, rely on accessible taxis (all London black taxis are wheelchair accessible) or buses, or even a driver guide for day trips out of the city. But not the Tube! Seasoned travelers Roger and Linda Gustafson of Princeton, Canada speak on accessiblity in travel. Roger, who uses an electric wheelchair, and Linda have visited more than a dozen foreign countries and traveled throughout the United States over the past 13 years and have learned that with the right planning, anyone with accessibility issues can travel. "The more we know about our options, the more we can travel like everyone else," Linda said. Accessibility issues can include anything from a sprained ankle or bad knees to oxygen tanks or wheelchairs, the Gustafsons said. Regardless of the specific limitation, anyone can plan a successful trip. In fact, since 1990 in the Unites States, the Americans With Disabilities Act has required by law that a person has the right to accessible travel options. The Gustafsons' No. 1 recommendation for accessible travel is advanced planning. Once a destination is chosen, start by contacting the venues to make arrangements specific to your needs. Contact the hotel and make arrangements using specific language to communicate your requirements. For example, Linda said: provide measurements of the wheelchair to ensure the doorways are wide enough, chair heights, to ensure the bed will be high or low enough, communicate that you need a roll-in shower and lowered sinks. "Communicate in a very clear manner," said Linda. "The staff cannot be expected to know or anticipate what we need." The Board has organized an advisory committee as part of its review and update of the ADA Accessibility Guidelines for Transportation Vehicles. The Rail Vehicles Access Advisory Committee will develop consensus recommendations for the Board's use in updating sections of the guidelines that cover vehicles of fixed guideway systems, including rapid, light, commuter, intercity, and high speed rail. These guidelines, which were originally published in 1991, serve as the basis for standards that apply to new or remanufactured vehicles required to be accessible under the ADA. The committee's work will not extend to portions of the guidelines that address buses and vans, which the Board is already in the process of updating. The committee is structured to represent a balanced cross section of stakeholders and interested parties, including rail vehicle manufacturers, transit providers, disability groups, and others, as indicated in a published notice. Members were selected based on responses to a request for nominations the Board issued in February. The Board regrets not being able to accommodate all requests for committee membership. Committee membership is voluntary, and members are not reimbursed for their services. The committee's work will be conducted in accordance with regulations governing Federal advisory committees. All committee meetings will be open to the public and will provide opportunities for any interested parties to provide information or offer comment. In addition, non-members may have the opportunity to participate in the work of any subcommittees formed by the committee. Details on the committee's first meeting will be released at a later date. For further information, visit the vehicles homepage or contact Paul Beatty at rvaac@access-board.gov, (202) 272-0012 (voice), or (202) 272-0072 (TTY). Those interested in this rulemaking and the work of the committee can sign up to receive further updates. Some of you may think my column reads more like a travel blog than a disability column. There's a reason for that. We love traveling. My reason for sharing our travels with you is so you can see that being in a wheelchair or having other types of disabilities should not keep you from doing what you enjoy. Traveling with a chair isn't always easy but it is doable with planning. I hope some of you will learn from our mistakes and benefit from things we did right. We just returned this weekend from a trip to Baltimore, Washington D.C. and Rehoboth Beach, Delaware. We drove, so travel itself was easy. The hotels were all accessible and even the pools at the hotels had a lift for people with physical disabilities. I would advise travelers with mobility issues to ask for an accessible hotel room when making reservations. Some Universal Design ideas are just so simple you wonder why you never thought of them yourself! Melilla forma parte desde ayer de la Red de Ciudades por la Accesibilidad que se creó durante la celebración del III Foro Internacional de Dise?o Universal que tuvo lugar en Málaga. Hasta la ciudad andaluza se trasladaron varios representantes de la Ciudad, entre ellos el Consejero de Seguridad Ciudadana, Javier Calderón, para participar en las conferencias sobre movilidad que continúan hoy y para entrar a formar parte de esta nueva red que pretende ser un espacio de intercambio de experiencias. Una veintena de localidades formará parte de este proyecto del que Melilla espera sacar ideas para la puesta en marcha de su futuro Plan de Movilidad, cuyo diagnóstico previo se presentó hace menos de un mes. Calderón aseguró que el alcalde de Málaga tuvo una mención especial para nuestra ciudad durante el discurso de constitución de la nueva Red. El consejero recordó además que la capital de la Costa del Sol ha colaborado con Melilla desde el primer momento en la elaboración del Plan de Movilidad y que por esa razón decidieron aceptar la invitación para estar presentes, por primera vez, en este foro sobre accesibilidad. El consejero aseguró que en tres o cuatro meses se llevará a cabo el acto oficial de constitución de esta plataforma y que será entonces cuando se comience a trabajar para el desarrollo conjunto de iniciativas que mejoren la movilidad. En concreto, está previsto que sea el próximo 3 de diciembre, coincidiendo con el Día Internacional de la Discapacidad, cuando se formalice la creación de la Red. El uso de los espacios públicos, la organización del aparcamiento o el transporte urbano serán algunos temas que se abordarán en esta Red, según explicó Calderón. El máximo responsable del área de Seguridad Ciudadana insistió en que se trata de una iniciativa muy positiva y en que esperan poder sacar ideas que se apliquen posteriormente a Melilla. Asimismo, nuestra ciudad también hablará de su experiencia, a pesar de que aún se encuentra en una fase inicial. Junto a Melilla también estarán en este proyecto ávila, Santander, Cáceres, Linares, Vitoria, Torrent (Valencia), Carranque (Toledo), Valencia, Burgos, Valladolid, Sevilla, Alcaracejos (Córdoba), Basauri (Vizcaya), Pamplona, Marbella, Granada, Almería, Melilla y Vélez Málaga. Se trata de ciudades que han elaborado o están elaborando, como sucede en la nuestra, un plan de movilidad con el objetivo de lograr ser más accesibles y sostenibles para los ciudadanos. Con la creación de la Red de Ciudades por la Accesibilidad se quiere propiciar la creación de espacios que realmente sean 'para todos'. Para llevar a cabo este proyecto se necesita la iniciativa municipal y el aporte de las personas con discapacidad y de las entidades que las representan para que ofrezcan el análisis de las necesidades, las prioridades y las formas de concreción de las mismas. 'La Ciudad Accesible' es una estrategia que tiene como principal fin mejorar la habitabilidad urbana y social a través del dise?o universal de los espacios y servicios públicos de las ciudades, las cuáles se encuentran en un proceso de cambio y transformación. En el documento de creación de esta Red se plantea la necesidad de un cambio de actitud en estas ciudades para adaptarse a las nuevas necesidades y la aplicación de una alternativa propia e imaginativa a los retos a los que se enfrentan. Universal Design experts at The National Association of the Remodeling Industry (NARI) recently posted a poll on www.NARI.org to determine which primary features homeowners would include in their remodeled homes. The poll revealed that 63 percent of pollers would include grab bars and barrier-free showers in their projects - most likely because the bathroom is an area where injuries tend to occur. Also, grab bars are not only for people in wheelchairs, but are conducive to people of all abilities and ages. Darius Baker, MCR, CKBR, UDCP, president of D & J Kitchens and Baths, Inc., points out that installing grab bars is somewhat easy when a bathroom is being torn out. The Amendments to the Americans with Disabilities Act (ADAAA) broadened the scope of physical or mental impairments which would be considered to be disabilities under the Americans with Disabilities Act (ADA). On May 15, 2013 the EEOC issued four separate "informal" guidance documents relating to cancer, epilepsy, diabetes and intellectual disabilities...It is important to remember that since the ADAAA, the focus has been less on whether a condition is a disability and more on the interactive process to determine reasonable accommodations. Collaborating with the U.S. Business Leadership Network and Delaware Gov. Jack Markell, 2013 chair of the National Governors Association (NGA), the Council cohosted this unprecedented gathering to solicit promising employment practices and lessons on public-private partnerships from the corporate and foundation attendees. This information will be part of Gov. Markell's policy "blueprint" that he will provide to his NGA colleagues to help increase equity in employment of individuals with disabilities. The governor's signature initiative this past year has been devoted to raising awareness about the employment challenges people with disabilities are facing coming out of the recession, as well as what states can do as employers, service delivery stewards, and economic development leaders to increase employment opportunities for these citizens. While labor force participation is gradually increasing for those whose jobs disappeared during the Great Recession, this is not the case for people with disabilities. The steep decline in employment of people with disabilities--one million lost their jobs during the recession--is showing little sign of improvement. Málaga ha albergado este miércoles la creación de la Red de Ciudades por la Accesibilidad, en el marco de la comisión de esta materia que la Federación Espa?ola de Municipios y Provincias (FEMP) ha celebrado en el Palacio de Ferias y Congresos durante el III Foro Internacional de Dise?o Universal y Movilidad. El Ayuntamiento de Málaga ha impulsado esta iniciativa, que ya se abordó durante el desarrollo del segundo foro. Concretamente, el área de Accesibilidad se encargará de coordinar y dinamizar esta red. Numerosos consistorios han mostrado ya su interés por formar parte de la misma. Entre ellos, ávila, Santander, Cáceres, Linares (Jaén), Vitoria, Torrent (Valencia), Carranque (Toledo), Valencia, Burgos, Valladolid, Sevilla, Alcaracejos (Córdoba), Basauri (Vizcaya), Pamplona, Marbella y Vélez-Málaga (Málaga), Granada, Almería y Melilla. Muchas de estas urbes son Premio Reina Sofía de Accesibilidad y varios representantes de las mismas han estado este miércoles en el III Foro Internacional de Dise?o Universal. Asimismo, el Comité Espa?ol de Representantes de Personas con Discapacidad (Cermi); la Universidad de Málaga (UMA), a través de la Escuela de Arquitectura, y la Asociación Ciudad Accesible se van a unir a esta iniciativa. Tras el nacimiento de esta red en Málaga, los ayuntamientos que han mostrado su interés en formar parte de la misma llevarán a sus respectivos plenos el documento de adhesión, de forma que el acto de constitución tendrá lugar en la sede de la FEMP en fechas próximas al Día Internacional de las Personas con Discapacidad, que se celebra el 3 de diciembre. Con la creación de la Red de Ciudades por la Accesibilidad se quieren propiciar lugares accesibles para todos. Para llevar a cabo este proyecto se necesita la iniciativa municipal y el aporte de las personas con discapacidad y de las entidades que las representan para que ofrezcan el análisis de las necesidades, las prioridades y las formas de concreción de las mismas. Los municipios tienen a su alcance las herramientas necesarias para dise?ar espacios que puedan ser habitados por todas las personas. Urbes que ofrezcan servicios dirigidos a todos los ciudadanos, con criterios de dise?o universal, teniendo la accesibilidad como objetivo transversal de sus actuaciones. El Palacio de Ferias y Congresos de Málaga abre este miércoles y el jueves sus puertas para acoger la tercera edición del Foro Internacional de Dise?o Universal y Movilidad. La tercera edición de este foro se enmarca dentro del concepto del dise?o de una ciudad para todos, este a?o haciendo hincapié en temas de movilidad ciudadana y adaptabilidad para personas con diversidad funcional para que puedan llevar a cabo tareas cotidianas y desenvolverse con normalidad en el entorno. Este evento ha contado en su inauguración con la presencia del alcalde de Málaga, Francisco de la Torre; el director general de Personas con Discapacidad de la Junta de Andalucía, Gonzalo Rivas; el presidente del Comité Espa?ol de Representantes de Personas con Discapacidad, Luis Cayo; el secretario general de la FEMP, ángel Fernández, y el director general de Accesibilidad de Fundación ONCE, Jesús Hernández, entre otros. En este sentido, el alcalde de Málaga ha declarado que "adaptar la ciudad es una tarea fundamental para todos, para hacer de Málaga un referente en materia de dise?o universal tanto nacional como internacional". "Esto nos anima a seguir trabajando más; hemos avanzado, aunque aún nos queda mucho por hacer", ha a?adido. Por otra parte, el director general de Personas con Discapacidad de la Junta de Andalucía ha comentado que "es un acierto llevar a cabo la convocatoria de este foro, ya que concienciar a los asistentes es una tarea fundamental". El presidente de Comité Espa?ol de Representantes de Personas con Discapacidad ha calificado el foro como "una innovación social los avances que se han hecho en materia de movilidad" y ha se?alado que la "ciudad de Málaga es un referente importante", por lo que ha animado a todos los municipios espa?oles a que "sigan los mismos pasos". El director general de Accesibilidad de la Fundación ONCE ha agradecido la convocatoria de este evento, puesto que "es un honor para las personas con alguna discapacidad poder contar con esta cita y con la dedicación de todos estos profesionales que hacen posible el evento". Al finalizar el acto de inauguración, De la Torre, acompa?ado por los asistentes al evento, ha realizado un recorrido por los diferentes expositores. El III Foro Internacional de Dise?o Universal y Movilidad cuenta con una treintena de actividades, tales como conferencias, mesas redondas o exposiciones. Además, este evento es un punto de encuentro para la Administración pública y las empresas privadas para implicar a las dos partes en un mejor desarrollo y construcción de las ciudades. Se exponen productos, servicios y distintas soluciones para construcción de entornos accesibles. Este foro apuesta no sólo por la seguridad en el planteamiento de nuevos proyectos, sino también por la eficiencia a la hora de trabajar tanto en espacios públicos como privados. 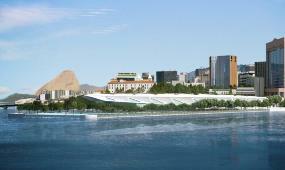 According to GVAM, the accessible virtual museum guide and Design for All Foundation award finalist 2013, Brazil is currently experiencing a major cultural drive. With this in mind, José Pajares, GVAM's Researcher and Product Director recently visited Rio de Janeiro to investigate approaches to implementing new technologies and accessibility in Brazilian museums. In an interview to share his experiences with the GVAM team, he notes how he was struck by the country's strong academic tradition in museology, with, for example, 12 specialist faculties dedicated to the topic. As there is no well-established tradition of new technologies and accessibility, many stakeholders are initiating innovative projects. The interview opens with his reflection that, perhaps because Brazil does not have the same quantity of historical heritage as in Europe, a greater level of creativity and sensitivity is required when it comes to identifying and evaluating its heritage, both tangible and intangible. To this end, they have adopted important measures to ensure that Brazil is a leader in cultural affairs, such as enacting a federal law to promote culture and reinforcing the importance of educational departments in museums. To read the full interview, visit the GVAM website. On June 4, 2013, the U.S. Department of Housing and Urban Development (HUD) issued new guidance to "encourage participation in state efforts" to assist individuals with disabilities who are "moving out of institutions and into [community-based] housing." The guidance, titled "Statement of the Department of Housing and Urban Development on the Role of Housing in Accomplishing the Goals of Olmstead," is part of HUD's efforts to ensure compliance with the U.S. Supreme Court decision Olmstead v. L.C., in 1999, which held that unjustified segregation of individuals with disabilities violdated Title II of the Americans with Disabilities Act (ADA). The HUD guidance notes that recipients of federal funding not only are prohibited from discriminating against people with disabilites but also have an obligation to Affirmatively Further Fair Housing (AFFHA). This obligation could include activities such as "providing integrated, affordable housing opportunities for individuals with disabilities," developing or rehabilitating units that contain "universal accessibility and visitability features that go beyond the minimum accessibility requirements established by federal laws and regulations," and affirmative marketing, and other "innovative ways to further the integration of individuals with disabilities throughout their communities." So the point of taking the time to reflect on what we've learned at UDS5 was the importance of us understanding that we're not only trying to make homes usable and safer for individuals, but we're trying to make a dent in our communities and in our culture (just as others are trying to do in their communities). The joy of walking around town, buying things at local businesses, and participating in leisure activities are important parts of our lives. Universally designed places, products, and programs are more than just making accommodations for those with specific needs, it's about allowing people to enjoy the experience of life through the avenue of good, functional design. Here are a few more posts on Day 1 and Day 2 of our experience at UD Summit 5 last week! La capital malague?a albergará esta próxima semana la constitución de la Red de Ciudades por la Accesibilidad. La creación de esta Red se enmarca dentro del orden del día de la comisión de accesibilidad que la Federación Espa?ola de Municipios y Provincias (FEMP) va a celebrar durante el III Foro Internacional de Dise?o Universal. Este próximo miércoles, una vez que finalice la comisión, se celebrará el acto de constitución. El Ayuntamiento de Málaga ha impulsado esta iniciativa que se abordó durante el desarrollo del segundo foro. Concretamente, el área de Accesibilidad se encargará de coordinar y dinamizar esta red. Numerosos consistorios han mostrado su interés en formar parte de la misma. Entre ellos, ávila, Santander, Cáceres, Linares, Vitoria, Torrent (Valencia), Carranque (Toledo), Valencia, Burgos, Valladolid, Sevilla, Alcaracejos (Córdoba), Basauri (Vizcaya), Pamplona, Marbella, Granada, Almería y Melilla. Con la creación de la Red de Ciudades por la Accesibilidad se quiere propiciar lugares accesibles para todos. Para llevar a cabo este proyecto se necesita la iniciativa municipal y el aporte de las personas con discapacidad y de las entidades que las representan para que ofrezcan el análisis de las necesidades, las prioridades y las formas de concreción de las mismas, según han informado desde el Consistorio en un comunicado. "Los municipios tienen a su alcance las herramientas necesarias para dise?ar ciudades que puedan ser habitadas por todas las personas. Ciudades que ofrezcan servicios dirigidos a todos los ciudadanos, con criterios de dise?o universal, teniendo la accesibilidad como objetivo transversal de sus actuaciones", han precisado desde el Ayuntamiento de Málaga. Como se se?ala en el documento que se acordó en el anterior foro, es necesaria la creación de esta Red de Ciudades por la Accesibilidad, que refuerce las prácticas municipales y que sea un foro de intercambio de experiencias y buenas prácticas en el dise?o de ciudad. Los municipios que quieran adherirse a esta Red deberán tener los siguientes requisitos: Plan Municipal de Accesibilidad; Ordenanzas de Accesibilidad; Consolidación del tejido asociativo de personas con discapacidad; Aplicación de presupuestos específicos para llevar a cabo eliminación de barreras físicas y de la comunicación; Presentar de forma manifiesta la voluntad política de llevar a cabo actuaciones transversales en lo referente a la accesibilidad. "Es el inicio de un ambicioso proyecto, como se subraya en dicho documento, que tiene como objetivo impulsar las actuaciones municipales basadas en criterios de dise?o universal, creando el compromiso de consolidación de esta Red de Ciudades por la Accesibilidad, mediante los órganos o mecanismos que se determinen por los componentes de la misma", han se?alado desde el Ayuntamiento. 'La Ciudad Accesible' es una estrategia para mejorar la habitabilidad urbana y social a través del dise?o universal de los espacios y servicios públicos de las urbes, las cuales se encuentran en un proceso de cambio y transformación, por lo que se plantea un cambio de actitud y una alternativa propia e imaginativa a los retos a los que se enfrentan. La ciudad de Málaga acoge los próximos días 5 y 6 de junio la celebración el Foro Internacional de Dise?o Universal y Movilidad, que alcanza su tercera edición como el evento de referencia en la promoción del dise?o para todos..
Este encuentro, que se desarrollará en el Palacio de Ferias y Congresos, continúa la trayectoria iniciada en 2008 por el Ayuntamiento de Málaga con el objetivo de propiciar un espacio de análisis, encuentro, reflexión y también de muestra de las distintas prácticas, servicios y productos en el sector de la accesibilidad y la movilidad, dentro de la filosofía del dise?o universal en la construcción de una ciudad para todos. En total, ofrece una treintena de actividades, entre conferencias, mesas redondas, actos institucionales y exposiciones, entre otras. En esta edición, se hará hincapié en el concepto de movilidad en la ciudad, eje fundamental en el dise?o de las urbes del siglo XXI. El Dise?o Universal apuesta por trabajar en el planteamiento de proyectos de configuración de espacios públicos y privados donde todas las personas puedan desenvolverse en igualdad de condiciones, independientemente de sus circunstancias y capacidades, siempre en el marco de la seguridad y la eficiencia. Se trata del foro de referencia en la promoción del dise?o para todos y la vida Independiente. Asimismo se configura como un punto de encuentro para la Administración Pública y el sector privado implicado en la planificación y el desarrollo de las ciudades; una oportunidad de networking para los profesionales y una herramienta para la formación de ideas y puesta en común de propuestas para el desarrollo y gestión de la movilidad y la accesibilidad; así como espacio para la exposición de productos, servicios y soluciones para la configuración de entornos urbanos accesibles y seguros. El programa de actos se distribuye en varias sesiones, en horario de 9.30 a 19.00 horas el día 5 de junio, y de 9.30 a 14.00 el día 6. Contempla, además del Foro de Accesibilidad, una serie de Jornadas paralelas sobre transportes de la mano de la Asociación de Empresas Gestoras de los Transportes Urbanos Colectivos (ATUC), acerca de aparcamientos por parte de Asociación Espa?ola de Aparcamientos y Garajes (Asesga) y sobre Buenas Prácticas en Accesibilidad a cargo de la Federación Espa?ola de Municipios y Provincias (FEMP). También están previstos diversos talleres que abordarán aspectos prácticos de la accesibilidad tanto a los entornos físicos como a la comunicación, al tiempo que las adaptaciones y soluciones de bajo coste. Igualmente diversas entidades celebrarán sus actos institucionales en el marco del Foro, como la Comisión Regional del Transporte Público y la Comisión de Accesibilidad de la FEMP.